Forget the days of your vise jaws causing marring, nicks, or scratches on your projects. The ATLIN 6" vise jaw pads are crafted from a tough, but soft, non-marring nylon material and are designed specifically for holding delicate materials such as anodized or threaded items. 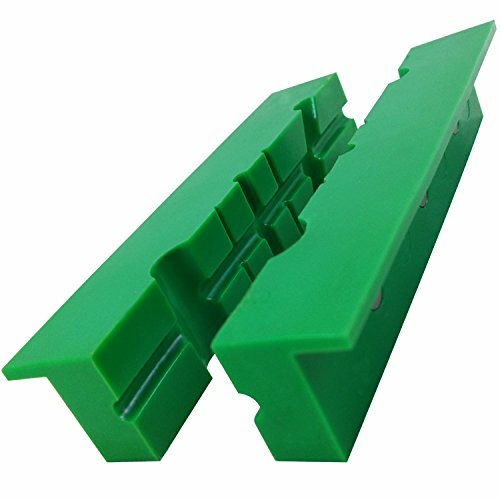 Due to the multi-purpose grooved design, these vice jaws are popular among those who participate in woodworking, gunsmithing, and jewelry making. WILL THIS FIT MY VISE? The ATLIN soft jaw pads will fit any vise of 6" in length or greater. Customers often use the ATLIN Vice Jaws on their machine vises, milling vises, drill press vises, armorers vises, and bench vises. There is no need to worry about bolts or screws, because the nylon jaws use 3 neodymium magnets to attach to your vise. WHAT ARE THE DIMENSIONS OF THE VISE PARTS? Groove Sizes (⌀): 3/8" @ 60° angle | vertical grooves: 1/4", 1/8", 1/16" 5/8" | horizontal groove: 1/4" - See second photo for further details. • Gunsmithing - Whether you are installing sights, or making more complicated adjustments, these vise jaws will tightly grip your firearm without causing any damage or surface marring. • Jewelry Making - Working on soft metals such is often a difficult task for those who make jewelry - ATLIN Nylon Vise Jaws will not damage even the softest metals such as gold or brass. If you have any questions about this product by ATLIN, contact us by completing and submitting the form below. If you are looking for a specif part number, please include it with your message.